Are you getting tired of your old furniture? Is your home feeling a little cluttered? Maybe it is time to redecorate. One of the simplest ways to drastically change the way your room feels is by adding a new glass table to your dining or living room. The Advantages of Glass Tables. A glass table offers many benefits over those made from wood or metal. One of the most important advantages is also the most obvious — glass table tops are transparent. The transparency of a glass table creates the illusion of space. Even in the smallest room, a glass table will open up the space and make the room feel larger and less cluttered. The “weightlessness” of a glass table allows light to pass through as well as providing an unobstructed view of the rest of the room. Another benefit of a glass table top is, due to its neutral appearance; it is easily adapted to create any mood. Simply by swapping dinnerware or decorative accents, homeowners can create endless variations to match their personal style perfectly. A glass table top looks great in a modern home, but it is equally suitable for a room with a more traditional decor. Everyone is worried about health and cleanliness. 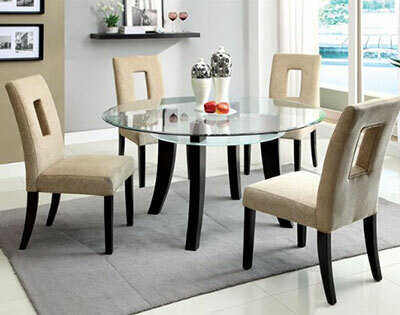 Unlike wooden table tops, a glass table top is simple to keep clean and germ-free. It is easy to wipe up any spills, and glass will not stain and trap harmful bacteria like other table surfaces. All you need is a clean cloth and a bottle of glass cleaner to keep a glass table top looking shiny and new. But, if this look isn’t for you, you don’t need to change your style to have the benefits. Custom glass tops can be made for your wood table. This can help with keeping your dining area germ-free, but the real advantage is keeping your wood surface free of scratches and stains. Glass tops help keep your dining table (or any tables in your home) looking like new. Furniture is a costly investment; glass tops protect and look beautiful. The High Desert Home For Glass Table Tops. High Desert homeowners near Apple Valley who are interested in purchasing a new glass table owe it to themselves to visit Vern’s Glass. With over 100 years of combined glass experience, the staff of Vern’s is experienced in selling and installing top-of-the-line glass products for commercial and residential properties. For any of your glass needs, you cannot go wrong with Vern’s Glass!